This is the gateway page to the Christian Web Ministry. The site is Christian in nature and is dedicated in thanksgiving to Our Lord and Savior Jesus Christ. 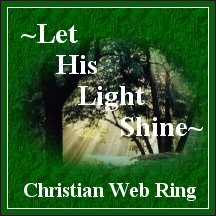 The site contains: Christian commentary, information on Christianity, various writings, and poems. Also included are: topical Bible studies, links to Christian groups and fellowship, web rings, web art, MIDI files and biblical research utilities. You will find topics such as: the Doctrine of Election; Salvation; the Trinity; the Godhead; the 2nd coming; and, Eternal Security in the ‘topical Bible studies’ section of the site. In the ‘Inspirational and Thought-provoking’ section, you will find writings and poems dealing with lifestyle, daily living, values, morals, ethics, etc. The site strives to spread, or evangelize, the love and 'Good News' of the Gospel of Jesus Christ. You will find something of interest on this site whether, or not, you believe in a Divine Being called God. The enlightenment, wisdom, and guide to ethical living contained in Holy Scripture, God’s Word, the Bible, is applicable to both the ‘born again’ believer and the non-believer. Do you know Jesus? *** Are you Saved? **** An invitation. **** Click here!! No matter which of God’s and Jesus’ many names and titles you use: Jehovah, Yahweh, Ya, JHVH, Supreme Being, the Great I AM, Yeshua, Yehowshuwa, Redeemer, Good Shepherd, the Way, the Truth, the Light, the Messiah, etc. you will find facts, evidence, proofs, information, helps, knowledge, and understanding on the site. To the non-believer in Salvation through God’s Sovereign Grace, I extend an invitation to view the site and to contact me about God’s gift of Salvation through Our Risen Savior Jesus Christ, and for answers to any questions you might have. (You will find message and e-mail links on the Feedback page.) To surf the site click on the Welcome Mat below, you will be taken to the main index page. Click on the welcome logo to enter.